As expected, the Financial Accounting Standards Board voted to go ahead with changes to the accounting standards for loan loss provisioning, but delayed implementation for a year. The current expected credit loss (CECL) model will go into effect for some public companies in December 2019 and for others in 2020 and 2021. The new standards will require most banks to provide credit quality indicators by year of origination. Final rules are expected in June, so banks will have several years to prepare. 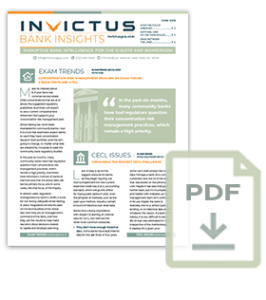 For more on CECL, see the October issue of Bank Insights. With hardly any new bank charters since the financial crisis, the Federal Deposit Insurance Corp. has decided to roll back its strict oversight of new banks. In 2009, the FDIC increased the de novo oversight period from three to seven years, mandating that new banks adhere to higher capital and other requirements. The FDIC said that extra scrutiny is no longer needed, thanks in part to the agency’s “more forward-looking approach to supervision.” Beyond loosening the rules, the FDIC is also planning to sponsor outreach meetings to encourage new bank charters and is developing a new handbook to explain the process to would-be bankers. The FDIC also updated its guidance for those seeking deposit insurance. The guidance outlines common weaknesses in unsuccessful business plans: insufficient details, overly broad strategies, unsupported assumptions, insufficient disclosures and inadequate executive strategies. The Fed wants banks below $50 billion in assets to know that it is willing to conduct its loan reviews off-site even for community banks, as long as they can send the loan files securely to the Fed. The Fed announced its interest in expanding the off program in a recent letter, noting that examiners are already attempting to do as much exam work off-site as possible “without compromising the effectiveness of the examination process.” Examiners are trying to review loan policies, loan loss reserve methodologies, risk assessments and loan groupings before they even arrive at a bank. Banks that participate in the program will also have off-site review of “credit files for quality, documentation and compliance,” which could include the appropriateness of individual credit ratings. Regulators at the FDIC’s recent community banking conference emphasized that even small banks should start using scenario analyses and stress testing if they have concentrations. “You probably want to do some ‘what ifs’,” said Maryann Hunter, deputy director of the Federal Reserve Board’s Division of Banking Supervision and Regulation. She said banks must understand what would happen to their portfolios if values changes, and reserve adequately for potential losses. “With commercial real estate, we have seen concentrations growing again. This was clearly a source of problems back in the earlier part of the 2000s, leading into the financial crisis,” Hunter said. “We are very committed to not getting behind the eight ball on that very issue again.” Regulators announced in December that they “will pay special attention to potential risks associated with CRE lending” in 2016, including mandating higher capital.